Keep It Simple And Trust God! It is best to try to keep it simple because it is when we complicate things our life becomes one problem followed by another! Here are some encouraging scriptures about keeping it simple. Let Your Yes Be Yes! And Your No Be No! James 5:12 Above all, my brothers and sisters, do not swear—not by heaven or by earth or by anything else. All you need to say is a simple “Yes” or “No.” Otherwise, you will be condemned. Why Should I Keep It Simple? The ABC’s of living a good life for God is simple, but we tend to make it complicated. This list will help you learn ways to keep it simple. What does it mean to keep it simple? To me, it is not to make more of a situation that it needs to be done. There are things to make significant, but other things it is best to overlook them and leave them be. 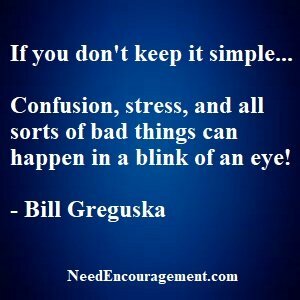 I find myself using the slogan, “Keep it simple” very often when things become complicated or when stress starts creeping into the situation. There are times when people focus on the minor points that are in the Bible instead of keeping things simple. Many minor points are in the Bible, but the bottom line, in a nutshell, is that the main point is that we are all sinners. Christ came to save us from our sins, He dies on the cross, was buried, and rose from the dead three days later in order to fulfill the scriptures, He has defeated Satan, He has saved His people from their sins in order for us to be with Jesus Christ in heaven with God The Father. When people disagree and even argue about their interpretation of the Bible, that is when Satan is doing his work to divide the Christian body. So my advice is to be understanding with one another on the small details, but the big issue points are not negotiable. Which then often leads to church splits or complete separate denominations. Keep in mind that we need always love God and to love one another. Is it enough to believe, even if we do not fully understand to go to heaven? Explain what it means that salvation is a gift from God? What is the simple church movement? Is it biblical? Two Things Remember To Keep It Simple! There are two things in life to remember, the first thing is not to sweat the little things, and the second thing is that everything can be considered small stuff if you look at it with a better perspective. We need to love God, love one another which kind of sums up what it takes to keep it simple and to live a healthy life! If you want to live a better life, the first place to look is to see if you are keeping it simple? Life is too short to hold grudges and resentments. Respect other people’s opinions even if you do not agree with them. If you find out that you are wrong, humbly admit it right away. Treat others in a friendly way. Get people on your side by finding common bonds. Talk about but never argue about religion; share your thoughts and respect others. Give people enough time to express what is in their mind and heart. Give other people credit for something said or done right. Try to be more sympathetic to others feelings and ideas. Attempt to find a thing in common and be open to differences. Ask others what their opinion is. A – Alert to know you will be tempted. B – Believe that God has a plan for your life. C – Care for those who need your help. 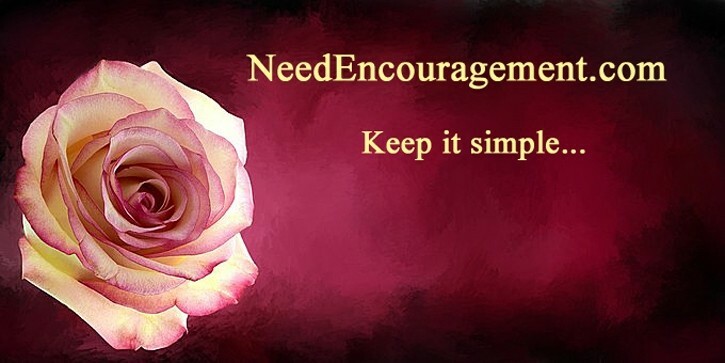 E – Encourage others to be the best they can be. F – Friendship is the hardest ship to sail. G – Give others your time, energy, talents, and tears. H – Hug those whom you love. J – Just say “Yes” to God. K – Kindness goes a long way, be kind always. L – Laughter is the best medicine ~ Make someone laugh. M –Make someone’s life better just by being there. N – Nurture your relationship with your family and friends and even strangers. O – Overlook faults in others, nobody, is perfect but God. Q – Quick to listen and slow to speak. R – Respect others, even if you do not agree with them. T – Thank God for all things. U – Understand that others also have their battles in life. V – Value life, do nothing that will hurt others. X – X-ray your intentions to make sure they are pure. Y – You must choose for whom you will follow, elect to follow the Lord. Z – Zealous to love God and your neighbor.